A pedestrian who was knocked down by a cyclist in a suspected hit-and-run last month has died. 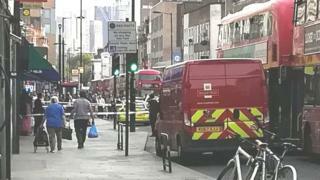 Sakine Cihan, 56, was crossing Kingsland High Street in Dalston, east London, at about 17:00 BST on 28 August, when she was struck. Police believe Ms Cihan is the first pedestrian in London to die after being hit by an electric bike. The male cyclist initially stopped after falling off his bike, but then fled the scene, police said. A man has been arrested in connection with the investigation and released while inquiries continue. The Met Police said a Specialized electric-assisted mountain bike was found abandoned nearby in Approach Close, Stoke Newington. In August the Department for Transport launched a consultation looking at whether new offences such as "death by dangerous cycling" should be introduced. The proposed changes followed the conviction of cyclist Charlie Alliston who was jailed for 18 months for killing mother-of-two Kim Briggs while riding an illegal racing bike which had no front brakes. Alliston was cleared of manslaughter but found guilty of causing bodily harm by "wanton and furious driving". Under the current law, the offence is the closest thing to dangerous driving a cyclist can be charged with. Department for Transport figures show that 29 pedestrians were killed in collisions involving cyclists between 2007 and 2016 - 0.6% of total pedestrian casualties on UK roads. Duncan Dollimore, head of campaigns at national charity Cycling UK, said the statistics showed people who use electric and conventional bikes "present a minimal danger to others". "Given the limitations and current laws governing e-bikes, Cycling UK does not believe there is any reason to suggest their use poses any greater risk to the public than a normal pedal cycle," he said.